Fortuna and the Scapegrace is a thoughtful comedic adventure toward a surprising Pacific paradise. 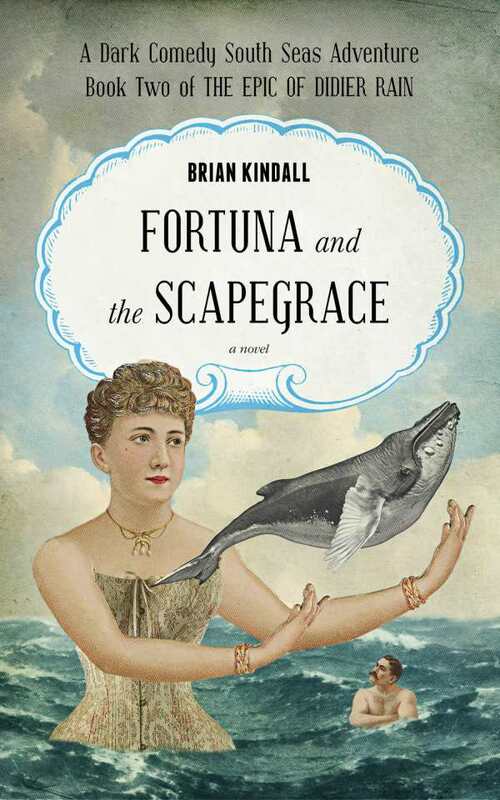 The second book in the Didier Rain series, Brian Kindall’s Fortuna and the Scapegrace is a maritime adventure that delivers its lead first to the decks of The Cloud as a cuckolded conscript, then to a Pacific island where the risks he faced at sea pale in comparison to the potential perils presented by a religious cult with some dangerous doctrine. The novel’s antihero literally buried his past under a marker bearing his given name and goes by multiple monikers over the course of the story. First, he christens himself Hoper Newfangle aboard The Cloud, where he separates from the ruffians in the crew by signing on as a caretaker for a nanny goat, Angeline, and her owner, Adamiah, the aspiring pastor of the Holy Church of the Shining Redemption and the hopeful fiancé of the current pastor’s daughter, Prudence. Adamiah’s genesis left him lacking in religious knowledge, so Hoper gives him a crash course in scripture on the way to the church’s island outpost, New Eden. Hoper is the ship’s lone passenger to arrive on the island, where he soon realizes that he and Adamiah had been studying a Bible very different from the one guiding the religious residents of New Eden. Regardless of the name he uses, Hoper is a mischievous rascal whose wayward ways make him sometimes less than likable. He can always be counted on to put ladies and liquor ahead of virtue and veracity. He’s never boring, though, and the novel’s other principal characters, including Hoper’s faithful furry friend, Angeline, are also drawn with enough detail to make them fit within the plot’s purposely farcical events. Angeline the goat is ready to deploy hoof and horn to defend herself and Hoper from the perils of the Pacific; Adamiah is painfully pure and naïve about women and worldly ways; Prudence is just as innocent, and all of her questionable beliefs and actions are backed by her church. Some of the church’s beliefs are hard to stomach, even in a comedic context. A few of the novel’s other running jokes are bawdy and are revisited too often. The plot gets off to a slow start on the shores of San Francisco, thanks to flowery writing that sets the story’s mystical and mysterious tone. For the most part, the poetic Hoper explains events in a way that keeps the plot moving past the parts that might not suit everyone’s tastes. Fortuna and the Scapegrace is a thoughtful comedic adventure that journeys across the Pacific and into the darker parts of some people’s idea of paradise.